Cindy Greenwell has graciously created a video for us. She has done a spectacular job of telling the story of the Women's movement from Suffrage to the current War on Women. Displayed at the end she's included information about our upcoming march in Washington, D.C. Please watch and share this amazing video. Thank you! In addition, we have launched a new slide show project. We would love for as many people to participate as possible. 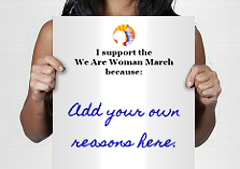 We are asking you to download the graphic, print it, write in your own reasons for supporting the We Are Woman March on Washington, and then send it to us using the contact form provided. We will compile all of the images that we receive into a slide presentation that will be displayed at the top of our homepage. 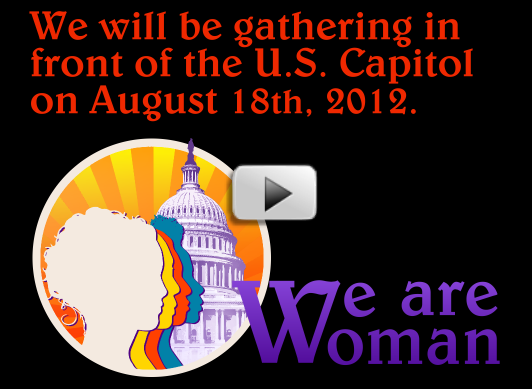 To participate please go to: http://www.wearewoman.us/p/i-support.html . Thank you again for all of your wonderful support and encouragement! We look forward to seeing you in D.C.!